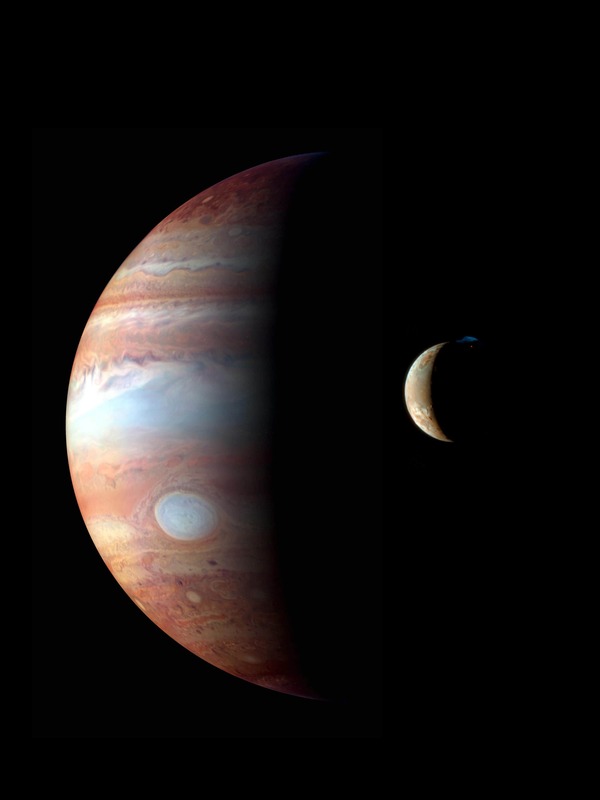 Jupiter wallpapers for your PC, Android Device, Iphone or Tablet PC. 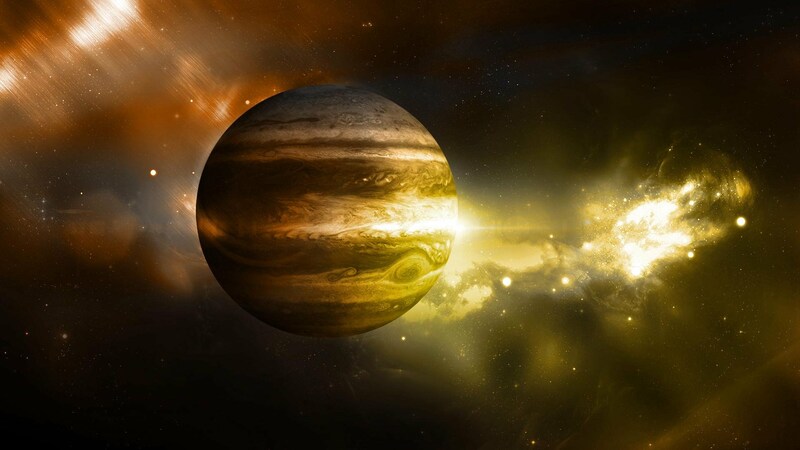 If you want to download Jupiter High Quality wallpapers for your desktop, please download this wallpapers above and click «set as desktop background». You can share this wallpaper in social networks, we will be very grateful to you. 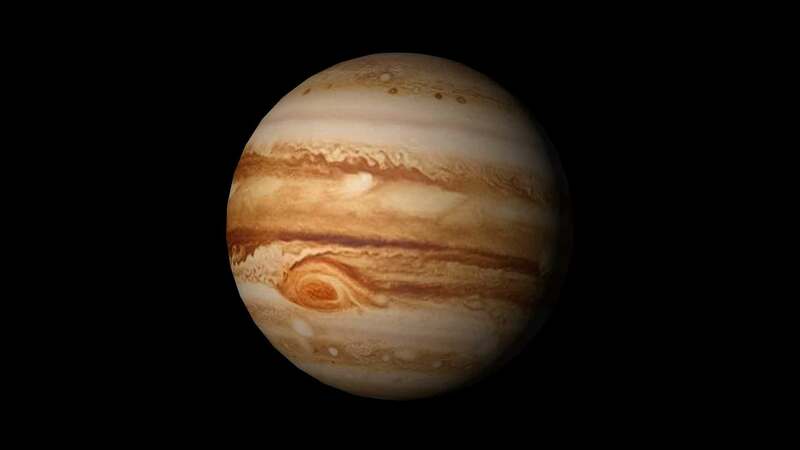 The fifth and largest planet in the solar system known from ancient times, is Jupiter. 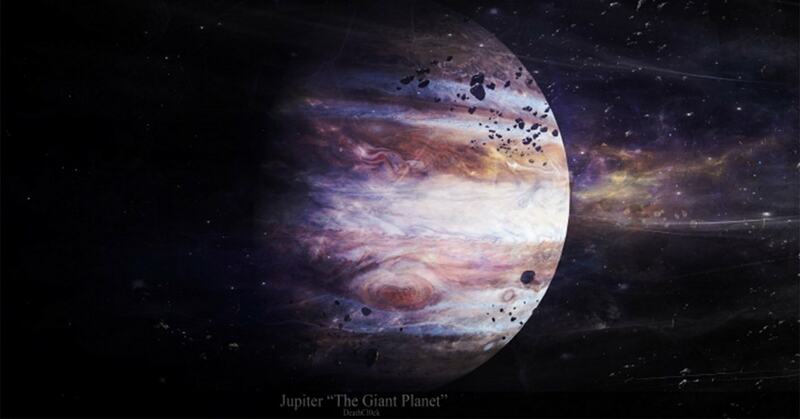 The gas giant was named after the Roman God Jupiter, similar to Zeus, the Thunderer of the Greeks. 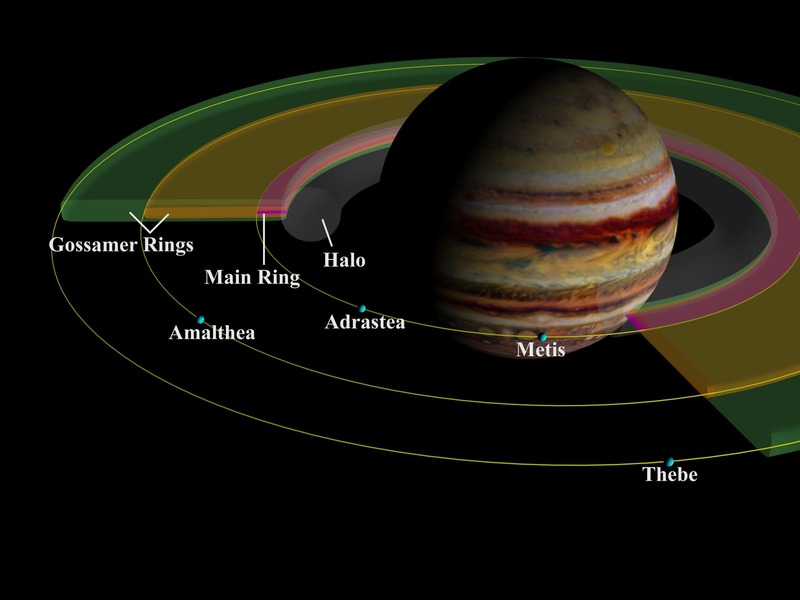 Jupiter is outside the asteroid belt and is composed almost entirely of gas, mostly hydrogen and helium. 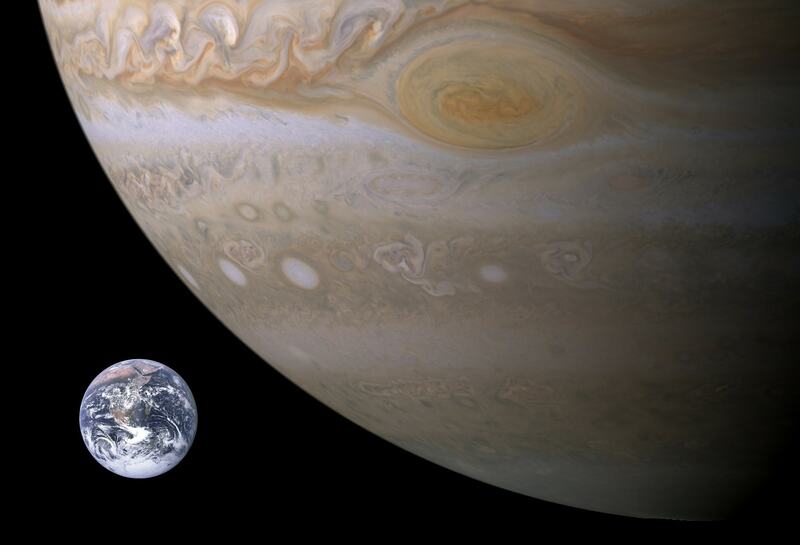 The mass of Jupiter is so huge (M = 1,9∙1027 kg) that is almost 2.5 times greater than the mass of all the combined planets of the solar system. 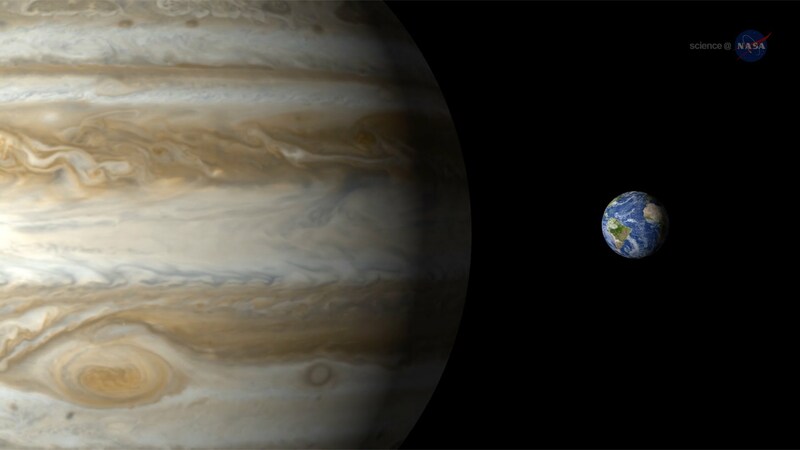 Around the axis, Jupiter rotates at a speed of 9 hours and 55 minutes, and the orbital velocity is 13 km/s. The sidereal period (the period of rotation on its orbit) is 11.87. 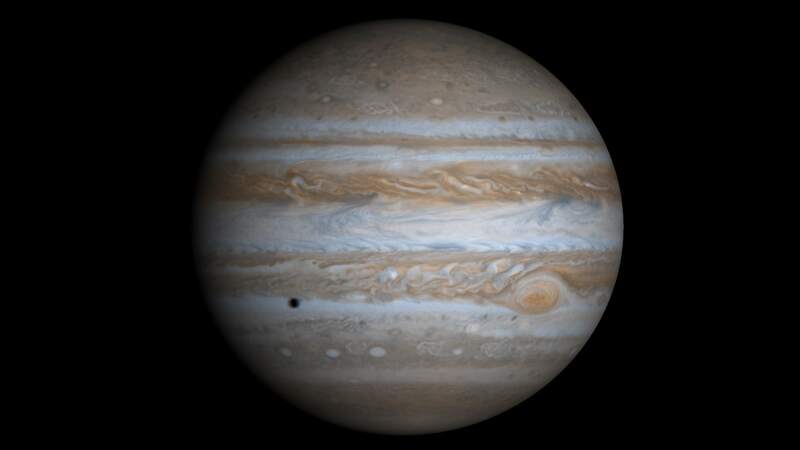 According to the degree of illumination, not counting the Sun, Jupiter is second only to Venus, therefore an excellent object for observation. It glows with white light with an albedo of 0, 52. In good weather, even in the simplest telescope you can see not only the planet itself, but the four largest satellites. The formation of the Sun and the other planets began billions of years ago from a common dust cloud. 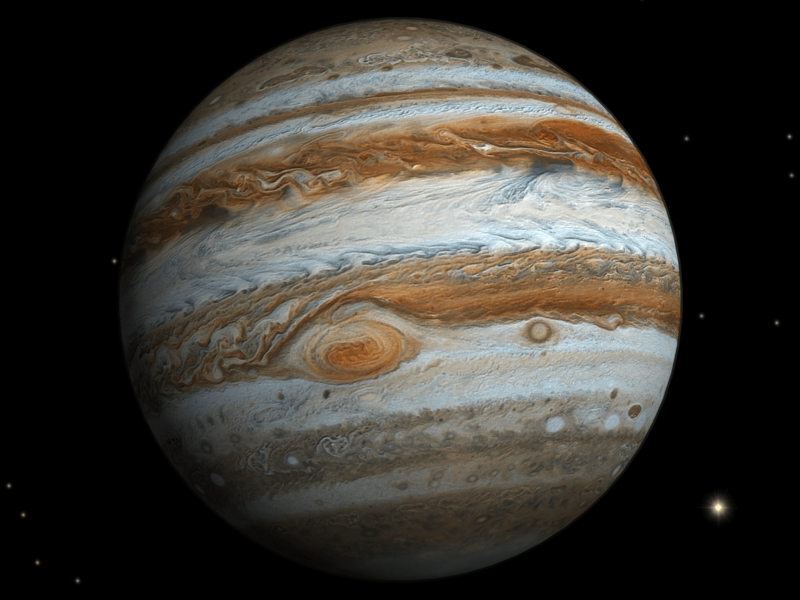 So Jupiter got 2/3 of the mass of the mass of all planets in the solar system. But, since the planet is easier the smallest stars in 80 times, the thermonuclear reaction has not begun. However, the planet emit 1.5 times more energy than it receives from the Sun. Own source of heat, is associated primarily with radioactive decays of energy and matter that is released in the compression process. 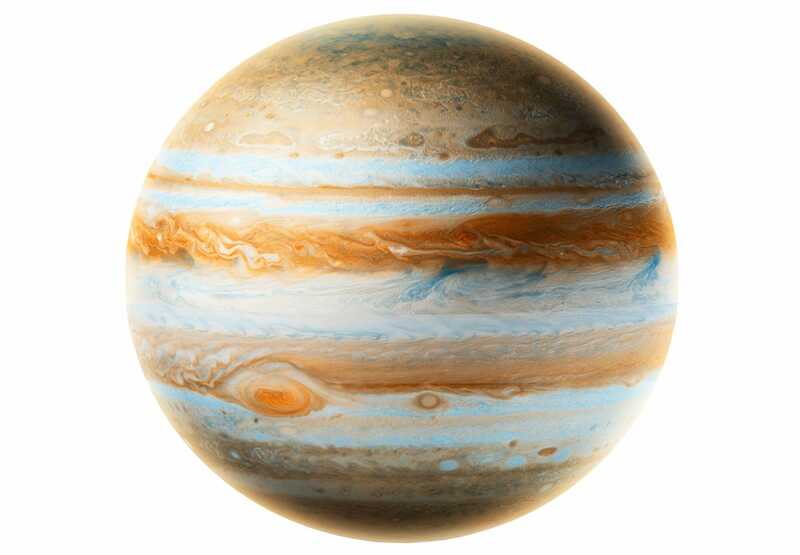 The fact that Jupiter is not solid, but gaseous planet. Therefore, the rotation speed at different latitudes varies. At the poles, the planet has strong compression, due to the rapid rotation around the axis. Wind speed exceeds 600 km/h. 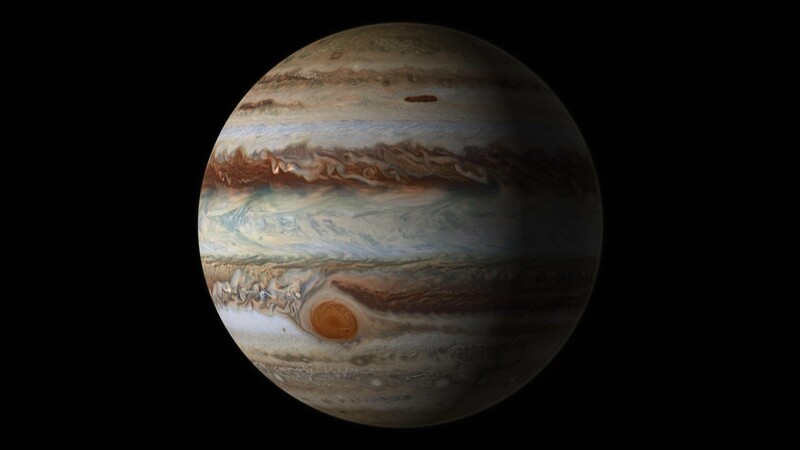 Modern science believes that the core mass of Jupiter at the moment is 10 Earth masses, or 4% of the total mass of the planet, and the size is 1.5 its diameter. It is rocky, with traces of ice. 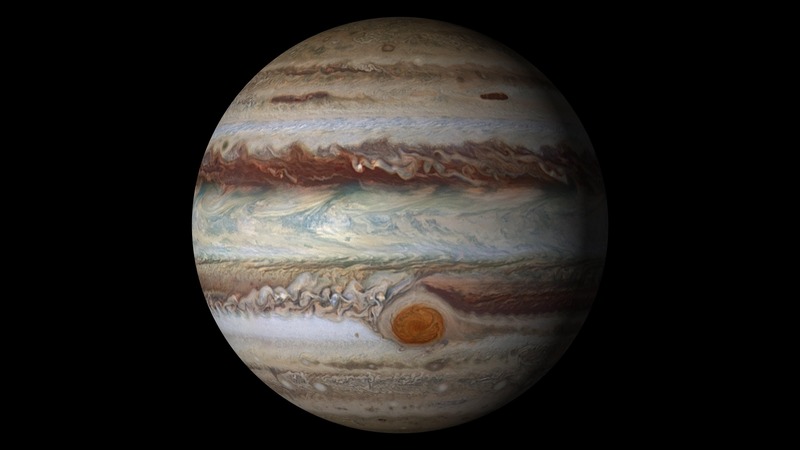 The composition of the atmosphere of Jupiter for 89,8% of hydrogen (H2) and 10% of helium (Not). Less than 1% methane, ammonia, ethane, water and other components. 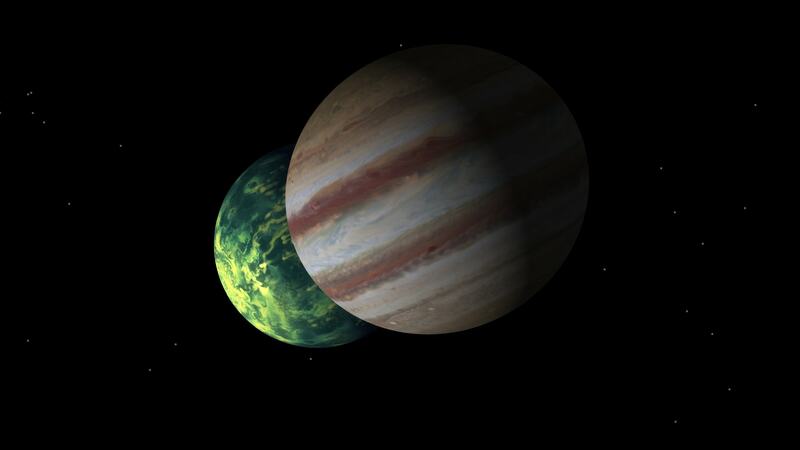 Under the crown of a giant planet has 3 layers of clouds. The top layer of frozen ammonia with a pressure of about 1 ATM., in the middle layer of crystals of methane and ammonium, and the lower layer consists of water ice or tiny droplets of liquid water. 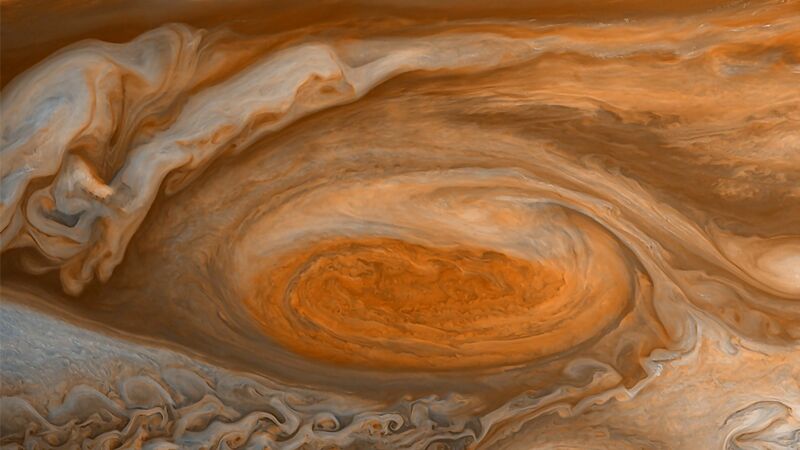 The orange color of Jupiter’s atmosphere gives a compound of sulfur and phosphorus. It contains acetylene and ammonia, so the composition of the atmosphere, is harmful to humans. Strips which stretch along the equator of Jupiter, known to all long ago. But nobody could really explain their origin. The basic theory was the theory of convection and lowering of the colder gas to the surface and climb over heated. 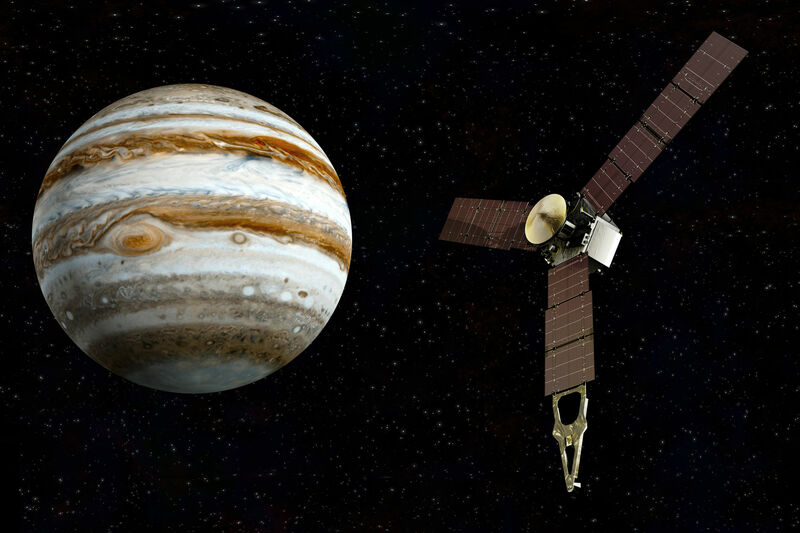 But in 2010, it has been suggested, the impact of satellites (moons) of Jupiter, the formation of bands. Supposedly, the attraction has formed a certain “pillars” of substances, which also rotate and are viewed as strip. Theory confirmed in the laboratory by experiment and now seems the most likely. 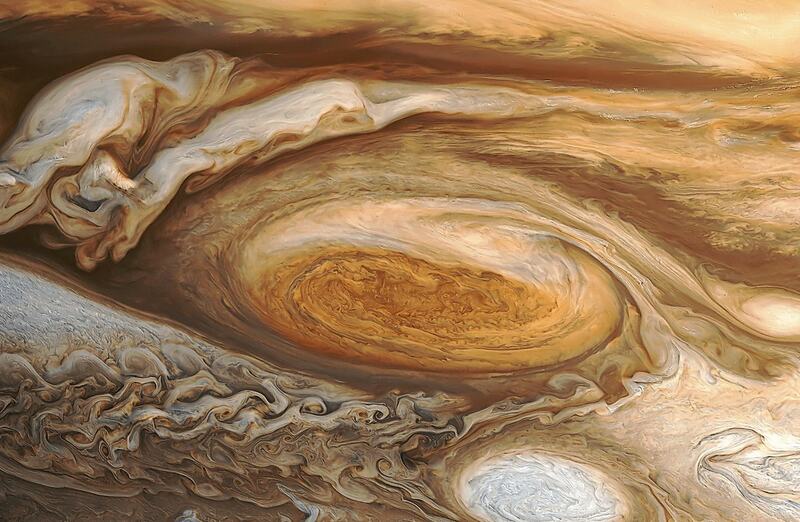 Perhaps the most perplexing and long term follow-up are described in the characteristics of the planet, can be considered the famous Great Red Spot on Jupiter. It was opened by Robert Hooke in 1664, therefore, watching him for almost 350 years. This is a huge formation, constantly changing in size. Rather, it is long-lived, giant atmospheric vortex, its size 15х30 thousand km, for comparison, the Earth’s diameter is about 12.6 thousand km. The magnetic field of Jupiter is so huge, that goes even beyond the orbit of Saturn and is about 650 000 000 km It exceeds the earth almost 12 times, and the inclination of the magnetic axis is 11° relative to the axis of rotation. 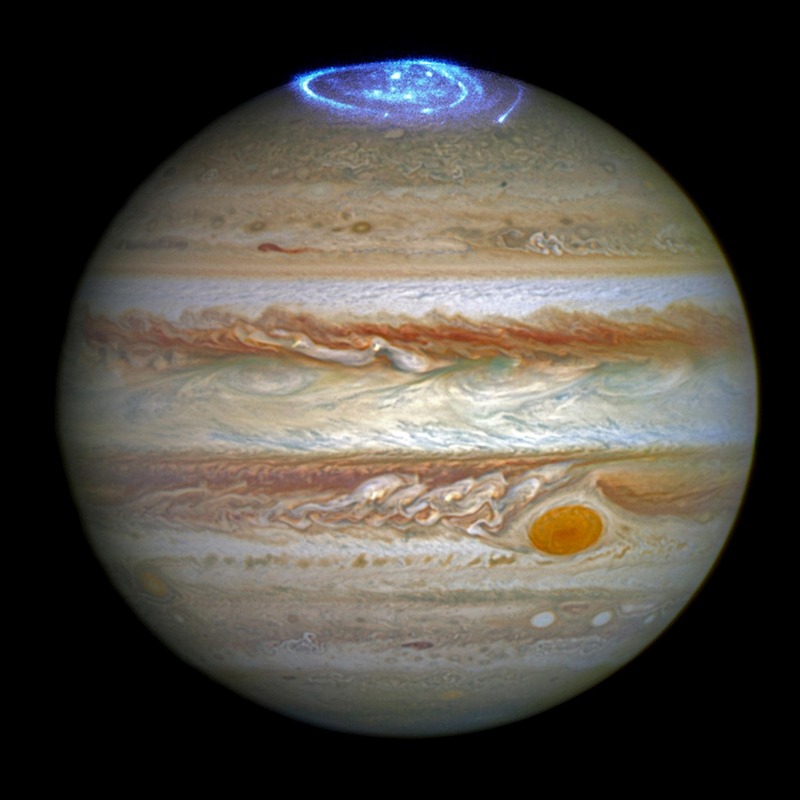 Metallic hydrogen is present in the bowels of the planet and explains the presence of such a powerful magnetic field. It is an excellent conductor and, revolving with great speed, forms a magnetic field. 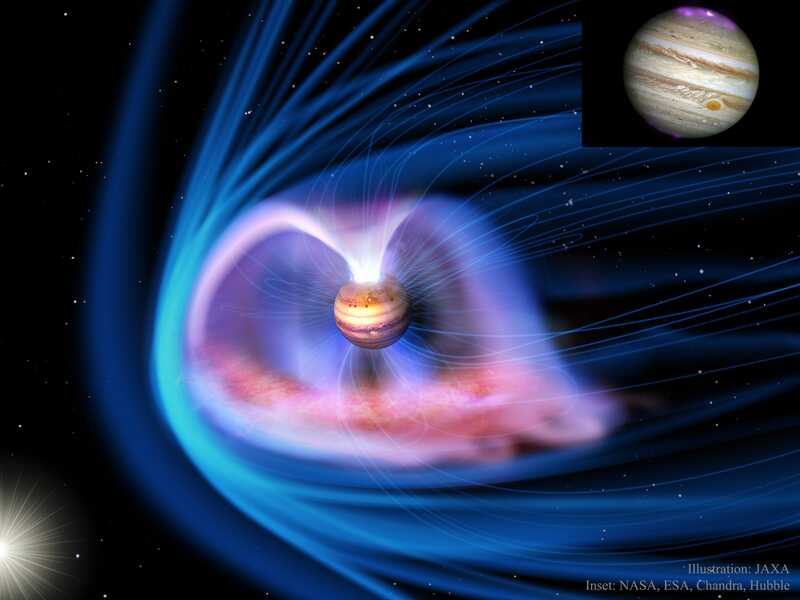 On Jupiter, as on Earth, also features 2 magnetic poles inverted. But the compass needle on the gas giant always points South. 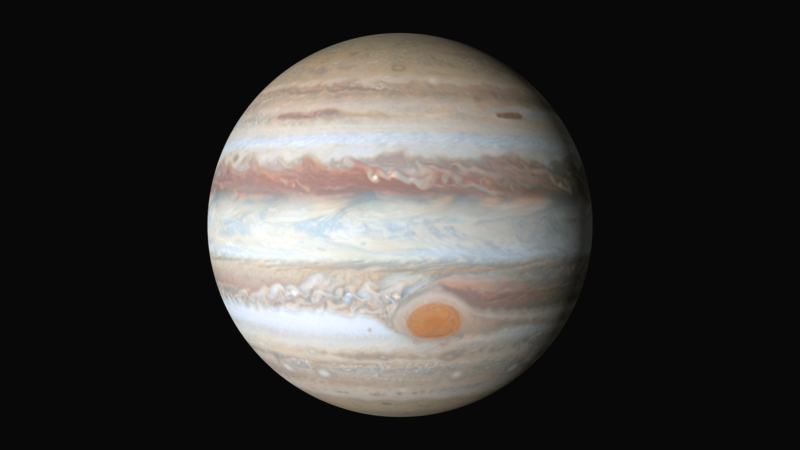 To date, the description of Jupiter you can find about 70 satellites, although supposedly about a hundred of them. The first and the biggest satellites of Jupiter – IO, Europe, Ganymede and Callisto – were discovered by Galileo Galilei in 1610. The most attention of scientists attracts the satellite Europe. The possible presence of life, he follows the moon of Saturn – Enceladus and took second place. They believe that there can be life. First of all, due to the presence of deep (up to 90 km) ice-ocean, smaller than even the earth’s ocean! Ganymede, just the biggest moon in the solar system. Yet, the interest in its structure and characteristics is minimal. IO, the volcanically active satellite, a large part of its surface is covered with volcanoes and covered with lava. Presumably, the satellite Callisto, also have the ocean. Most likely it is under the surface, as evidenced by its magnetic field. Density galeevich satellites, determine their distance from the planet. For example: the density of the remotely of the large moons – Callisto, p = 1,83 g/cm3, then as you get closer, the density increases: Ganymede p = 1,94 g/cm3, Europe p = 2.99 g/cm3, IO p = 3,53 g/cm3. 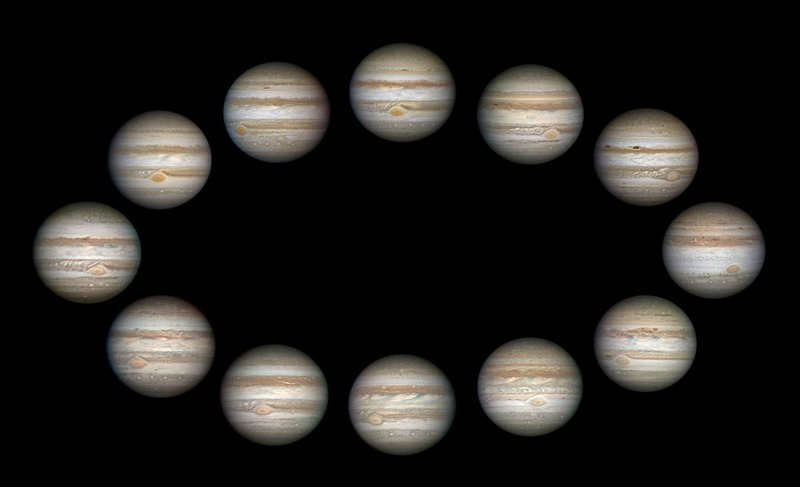 All large satellites, always facing Jupiter on one side and rotate synchronously. The rest were open much later. Some of them rotate in the opposite direction, in comparison with the majority and represent some of the bodies-meteorites, of different shapes.